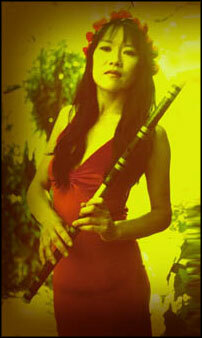 Suzanne Teng: World flute with a serene energy. 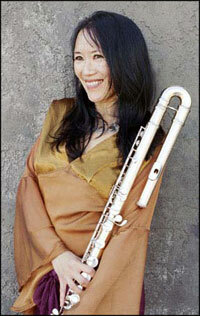 Suzanne Teng, is a flutist, percussionist, dancer, composer, teacher and recording artist from Berkeley, California. She has a master's degree in music from Boston University's School for the Arts and has studied with some of the finest flute teachers in the world. She is an award winning classical musician who, after traveling adventures across the globe, furthered her graduate studies at UCLA's Department of Ethnomusicology, where she completed the coursework for the Ph.D. focusing on music and healing. She is an active performer and recording artist in Los Angeles and is the winner of the Independent Music Awards Best New Age Artist for 2005 and 2001. 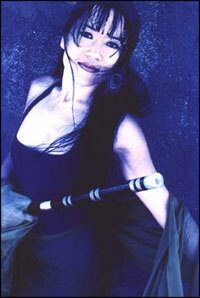 Her contemporary world music band Suzanne Teng & Mystic Journey was named a HOT 100 by Music Connection Magazine for 2003 and 2004. 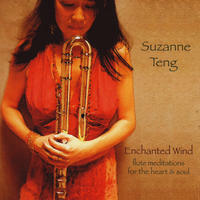 Suzanne's critically acclaimed recordings Miles Beyond and Mystic Journey feature her original compositions on which she plays a large assortment of flutes from around the world along with her partner Gilbert Levy on world percussion, band mates Fritz Heede on world strings and Barry Newton on string bass, and special guest master musicians from around the world. Mystic Journey was a finalist for the Just Plain Folks Awards 2004 Best Instrumental Album, a candidate for a Grammy nomination for Best New Age Album, appears on the UK Top Albums in New Age, and was a finalist for New Age Voice Magazine's Best Acoustic Instrumental Album and Best Contemporary World Music Album. 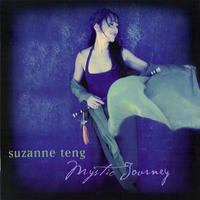 Billboard Magazine wrote "Sensual and Serene...Mystic Journey is an impressive solo debut." Both albums appear on numerous publication and radio "Top albums of the Year" lists including the Public Radio International nationally syndicated show "Echoes," and are listed by Amazon.com among the Most Requested New Age albums on the Radio. Known for creating heartfelt and healing music, Al Martinez of the Los Angeles Times claims "Suzanne Teng plays music for the soul." She has been commissioned to compose music for yoga and acupuncture videos, including works for well-known yogis Gurmukh and Ana Forrest. The Los Angeles Times wrote that Suzanne's music for the critically acclaimed play Caterpillar Soup "adds a spiritual quality to the production." She performs in concerts, festivals, and dance/movement/yoga events internationally as a soloist and with her world music band Mystic Journey. They were featured performers at His Holiness the Dala Lama's World Festival of Sacred Music and have represented the United States at International festivals in Mexico, Canada and Singapore. Suzanne has performed her flute meditations at numerous major events with spiritual leaders and writers such as Thich Nhat Hanh, Marianne Williamson, Deepak Chopra, Mathew Whyte, and Amachi, as well as for the top corporate leaders of Mexico and the US. She has also been a featured performer at the National Flute Association Conventions three times. Called a "brilliant flutist" by the Los Angeles Times, she has worked with a wide variety of artists and ensembles including the Boston Philharmnonic, Los Angeles Pops Orchestra, Tito Puente, Kenny Loggins, Babatundi Olatunji, Airto and Flora Purim, and The Dramatics. She has performed for numerous heads of state, including Henry Kissinger, and has appeared on the same venues as Sting, Jackson Browne, Patty Smythe, Colin Hay and Jody Watley. Suzanne has performed on hundreds of recordings for Polygram, Warner Brothers, Windham Hill, BMG, Shanachi, Scottie Brothers, and numerous independent labels. Select film, television and commercial performance credits include Pepsi, Johnnie Walker, California Tan, Murder, She Wrote, Big Bully (Tom Arnold), Separate Lives (Jim Belushi, Linda Hamilton), Baby (Farrah Fawcett), Green Dragon (Patrick Swayze, Forest Whitaker), The Grey Zone, The Kid Stays in the Picture (Robert Evans), Ice Bound (Susan Sarandon), numerous independent and foreign films, commercials for India, Germany, Korea and Mexico, and an Environmental PSA with music by Hans Zimmer. She has appeared on national television, including a musical performance on the Survivor II final episode which was viewed by over 40 million people. Her music has been heard on countless radio programs worldwide (ranking #3 on the New Age charts) and she has been featured on Public Radio International three times. She is an endorsed artist for Yamaha, AKG and High Spirit Flutes and is a popular teacher, having taught flute, percussion and world music to many hundreds of students at schools, colleges, camps and workshops throughout the country. She co-facilitates retreats, guiding music circles, most recently in Hawaii and Guatemala. She has practiced yoga for over 20 years, loves traveling, gardening, and hiking and has summitted 19,000' peaks in the Himalayas. Suzanne Teng lives in California, USA. Tagged as: New Age, World, Flute.